LARGE: Measures 63″ in length x 50″ across. This will wrap you up in style. The model is 5′ 10″ tall, so this is great for a tall person. PREMIUM FABRIC: 100% Knitted Acrylic; Hand Wash or Dry Clean. 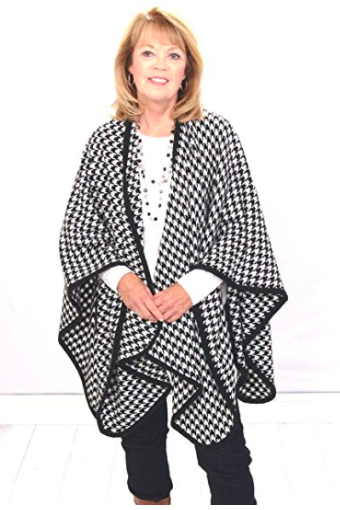 VERSATILE: The shawl’s generous size offers the opportunity to drape or wrap : Wear it for a casual day at the office, an evening out or even as an airplane blanket! CLASSIC Houndstooth style that will give you a long time of wear. 100% guarantee. Exuding an effortless sense of personal style and natural elegance, the poncho wrap is an indulgent mix of trendy and practical. This luxurious wrap is characterized by graceful simplicity and transforms any outfit into a timeless look worth remembering. 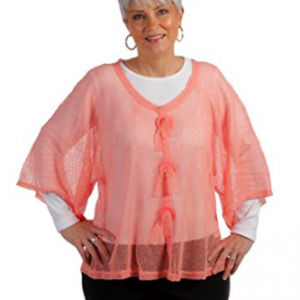 Ultra-soft fabric allows for maximum comfort and an added layer of cozy warmth. The wrap allows for easy movement and flexibility while ensuring you stay up-to-date with the latest fashions. The ample wrap size allows for great versatility, enabling the piece to be worn in a variety of occasions: For casual days at the office when the air is a little too chilly to more festive nights on the town when your outfit needs an extra pop. It’s the perfect accent to shift between temperatures. Hounds-tooth captures the looks of the season perfectly and adds a blended taste of the season, for a regal finishing touch on your outfit. 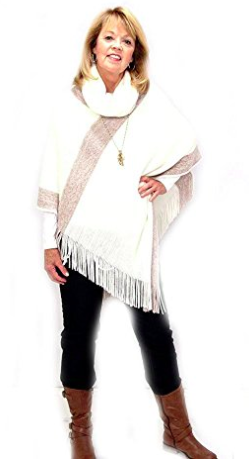 This poncho shawl wrap is a much appreciated and generous gift: Birthday, Easter, weddings, bridesmaids’ gifts, Valentines, Mother’s Day etc. The list is endless!